Whether you’re eating at home, dining out, or having dinner with friends, good table manners for kids are an important part of every meal. When you teach your child good table manners, you are giving them important tools for social interaction that will serve them for the rest of their lives. Plus, laying the groundwork for good etiquette at the dinner table means your children will more likely become pleasant dinner companions for family meals in the years to come. 1. Come to the table with her hands and face clean. Teach your children always to wash up before dinner, says Patricia Rossi, author of Everyday Etiquette. Not only does this show respect for the person who prepared the meal as well as others at the dinner table, but it is also an important healthy hygiene habit. 2. Always ask if there is anything you can do. Whether at home or someone else’s house, always ask the grown-up if you can help do anything to get ready for dinner. 3. If setting the table, remember BMW. Children who are old enough to help set the table can remember where things go with this simple rule: BMW. Bread and milk go on the left and water on the right. They can also remember where silverware goes by the number of letters in the words “left” and “right,” says Rossi. The fork goes on the left and has four letters. The knife goes on the right and has five letters. 4. Watch the host to see when you should unfold your napkin. If she puts her napkin on her lap, that’s the signal for you to put your napkin on yours. 5. Wait until everyone is served before eating. Tell your child never to begin eating until everyone is seated and served. 6. Never, ever chew with your mouth open. Chewing with your mouth closed and not talking when your mouth is full are two cardinal rules of good table manners. 7. Never stuff your mouth. Teach your child to take small bites and never wolf down his food. 8. Do not interrupt when someone else is talking. At the dinner table, practice having your child wait their turn to speak when talking about their day or another subject. Get kids into the habit of talking about news, their friends, how school was, and other interesting subjects. 9. Never reach to get something. Remind your child never to reach across the table to get salt or anything else he needs. Get her into the habit of asking table mates to pass something he needs. 10. Put the napkin on the chair, not the table. Teach your child always to put her napkin on her chair if she needs to use the restroom. It should never go on her plate or the table. 11. Always push his chair in when finished. When he gets up from the table, he should push his chair back against the table. 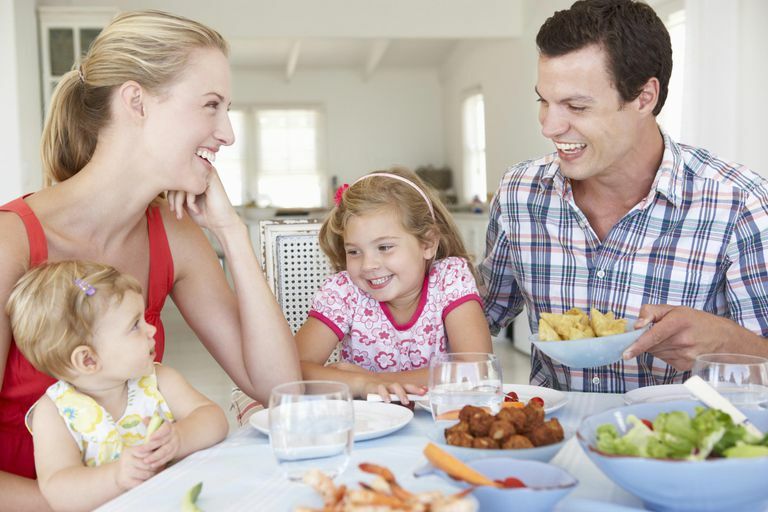 Good table manners, like good manners in general, will be appreciated by people who come into contact with your child. Teach her that when she shows respect for others, she will get great things in return.